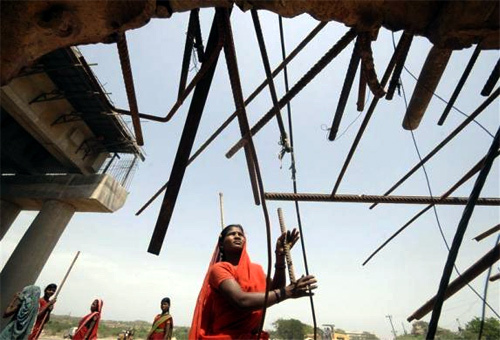 Acute shortage of labour and migration towards social schemes like Jawaharlal Nehru National Urban Renewal Mission (JNNURM) and Mahatma Gandhi National Rural Employment Guarantee Act (MNREGA), a large number of construction projects are lagging behind their completion schedules. 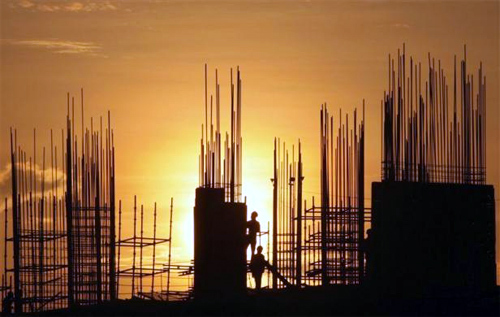 According to an Assocham study, the growth of India's construction industry due to the delay in completion of infrastructure projects has gradually dipped from about 30% in 2007 to over 20% in 2010 and to the current level of about 12%. 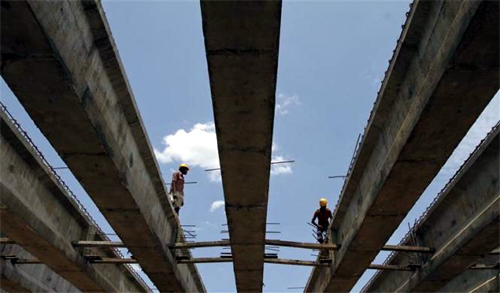 Image: Labourers work at the construction site of a flyover on the outskirts of Ahmedabad. 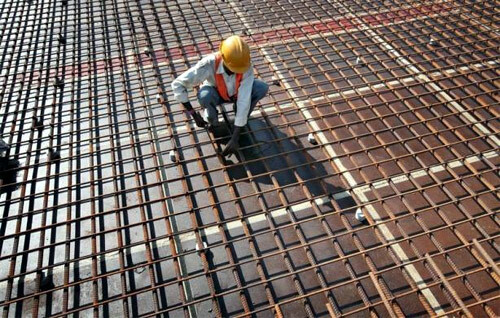 The market size of India's construction industry might not even reach Rs 30,000 crore mark by 2015 from the current level of about Rs 21,000 crore as the labour intensive sector has been constantly grappling with the shortage of workforce, Associated Chambers of Commerce and Industry of India (Assocham) study paper said. 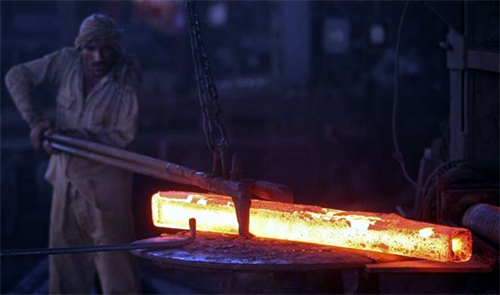 Image: A worker welds iron rods at the Metro railway construction site in Kolkata. To ascertain the extent of problems being faced by the construction industry and the major reasons behind its dipping growth Assocham representatives interacted with about 200 industry players representing various segments – roads, urban infrastructure, power transmission, real estate and others in five cities of Ahmedabad, Bangalore, Chennai, Delhi and Mumbai during June-September. 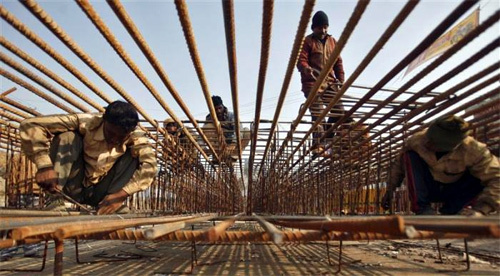 Image: Labourers work on iron rods at the construction site of a flyover at Noida in Uttar Pradesh. 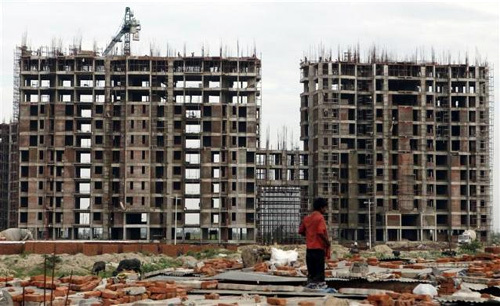 Labour shortage coupled with slowdown in capital investments, continuing economic downturn and lacklustre performance of realty sector are the major reasons cited for growing troubles for the construction industry as it is becoming difficult to bag orders, said 65% of the respondents. 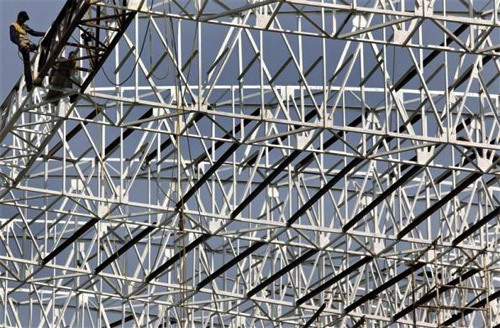 Of these many said that prices of key raw materials like cement and steel have risen by about 15% since the last fiscal, which together with upward spiraling base interest rates has impacted their operating margin by about 20%. 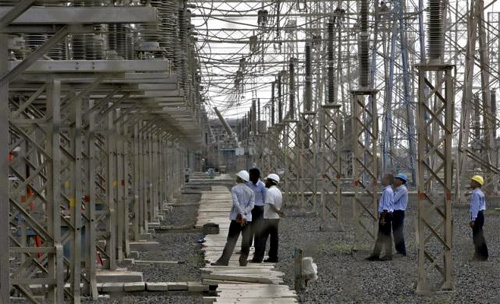 Image: Engineers inspect electric transmission lines at Adani Power Company thermal power plant at Mundra in Gujarat. Profitability of construction companies has also been under severe pressure due to rise in share of lower margin segments in the overall business and soaring levels of competition in the industry and high interest burden due to rise in working capital, said almost all the respondents. 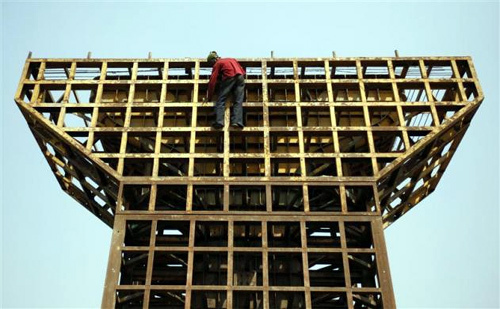 Image: A worker fastens iron rods together at the construction site of a bridge on Srinagar-Jammu national highway in the outskirts of Jammu. About 30% of those surveyed were mostly small players who said that they are not able to benefit from increasing mechanization in the construction sector as they do not have the required machinery. 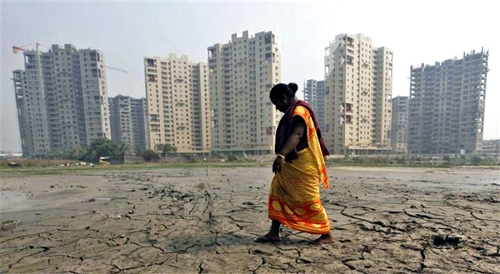 Image: A woman labourer walks past a residential estate under construction in Kolkata. 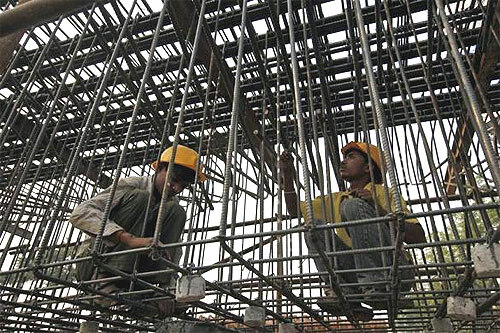 Many industry players have blamed government social schemes like Jawaharlal Nehru National Urban Renewal Mission (JNNURM) and Mahatma Gandhi National Rural Employment Guarantee Act (MNREGA) for locally generating jobs leading to continuous depletion of migratory workforce from the construction sector. 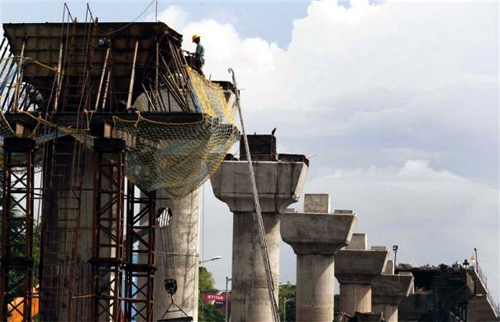 Image: Workers stand at the construction site of a flyover bridge in Chennai. To counter the growing burden, the industry is gearing up to develop and effectively leverage financial strength and technical capabilities to compete strongly, said the respondents. 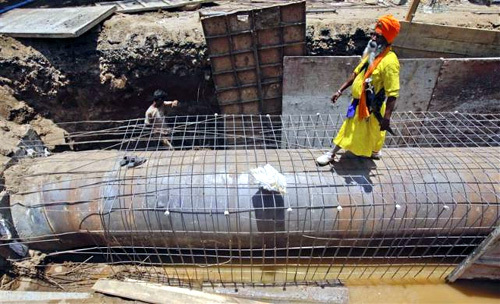 Image: A man walks at the excavation site of a water pipeline in Mumbai. 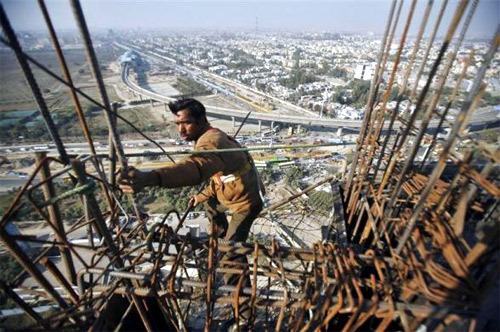 "Rampant shortage of semi-skilled and skilled workers including civil engineers and construction labourers has been causing delay in completion of infrastructure projects of late," said D S Rawat, secretary general of Assocham. 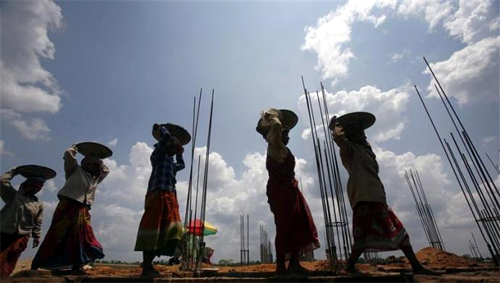 Image: Women labourers work at the construction site of a commercial complex on the eve of International Labour Day, or May Day, on the outskirts of Agartala. 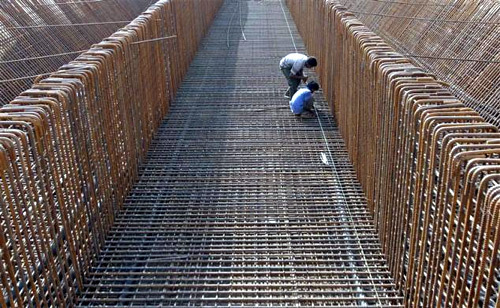 Labourers work on reinforcing bars at a construction site to build a bridge on the outskirts of Ahmedabad. 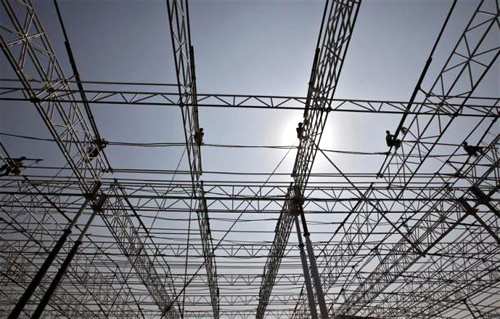 Workers use poles to construct a temporary ceiling at an exhibition ground in Mumbai. A labourer works at the Eden Gardens cricket stadium in Kolkata. 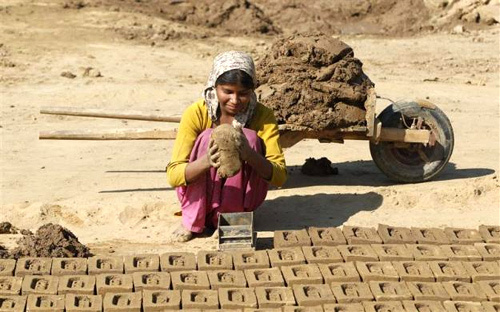 A woman labourer works in a brick factory at Libbar Hari in Uttarakhand. 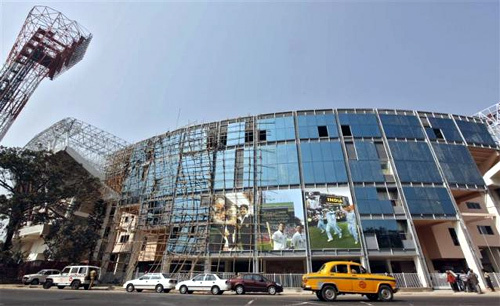 Labourers work at the Eden Gardens cricket stadium in Kolkata. A labourer climbs down from an under-construction pillar of a flyover bridge in Mumbai. 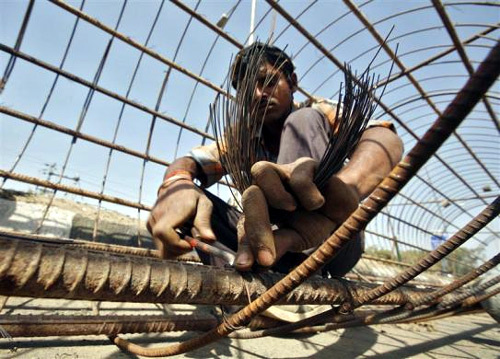 A labourer works on reinforcing bars at a construction site to build a bridge on the outskirts of Ahmedabad. 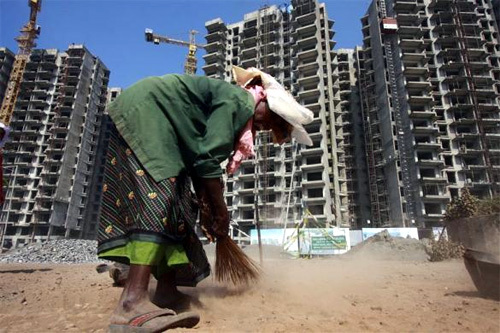 A labourer works at the construction of a residential complex at Noida in Uttar Pradesh. Children play in water pipes at a construction site on the banks of the Yamuna River in Allahabad. 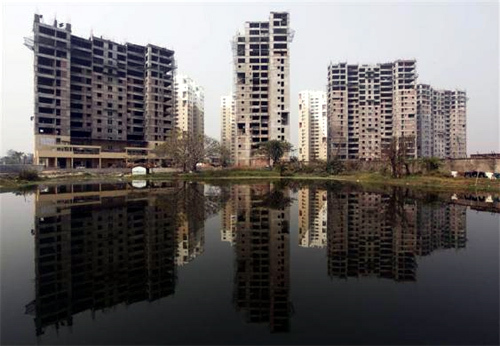 Residential apartments under construction are reflected on the surface of a pond in Kolkata. 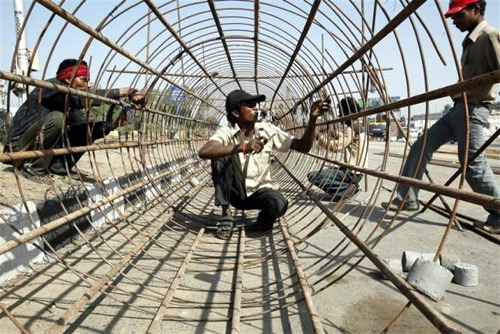 Labourers work at a flyover construction site in Mumbai. 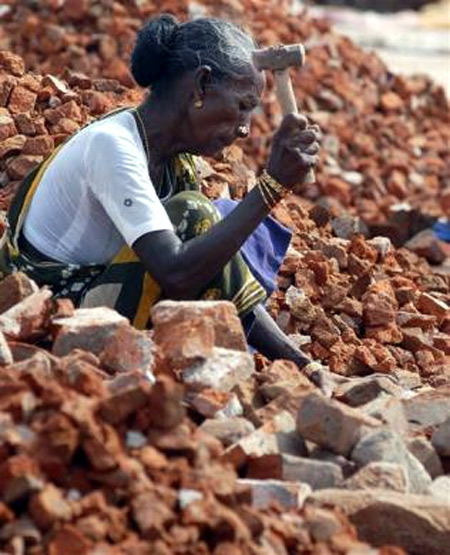 A woman working as a labourer breaks bricks at a construction site in Chennai. A woman labourer sweeps at the construction site of a residential complex in Kochi. 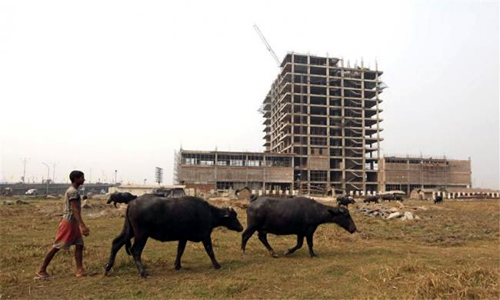 A man with his buffaloes walks at the site of a residential estate under construction in Kolkata. 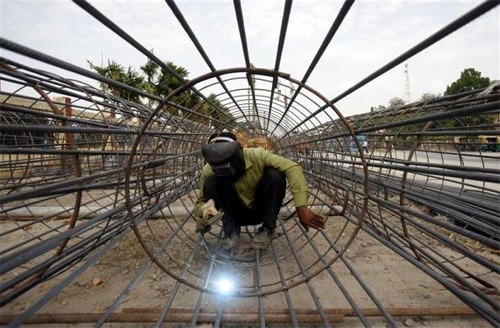 A labourer works at the construction site of a flyover in Kolkata. A woman labourer works at a road construction site on the outskirts of Hyderabad. Labourers work at the construction site of a residential complex on the outskirts of New Delhi. 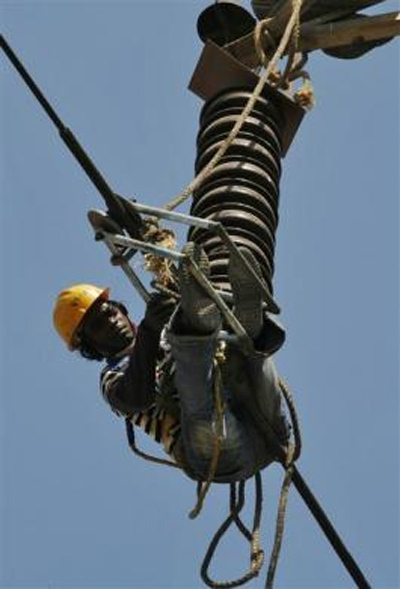 A labourer hangs on an electric power cable as he removes kites tangled up on it in Ahmedabad. 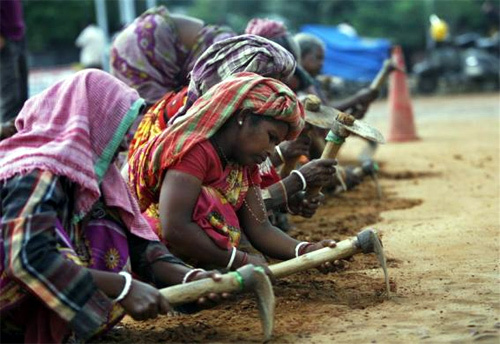 Woman labourers work at a road construction site in Agartala, capital of Tripura.